First Endurance 2012 PreRace Capsules 90 Ct.
PreRace Capsules (Regular Capsules and Sustained Release PRE RACE Prototype Versions) are a revolutionary new pre-exercise supplement developed to provide endurance athletes with a potent mental and cardiac jump-start prior to races or workouts. The Pre-race formula provides all the necessary ingredients needed to increases mental stamina, increases time to exhaustion, increases maximum workload, improves mental clarity and increases oxygenation of muscles. Features include caffeine, taurine, qurcetin and a proprietary neuro-stimulant blend. 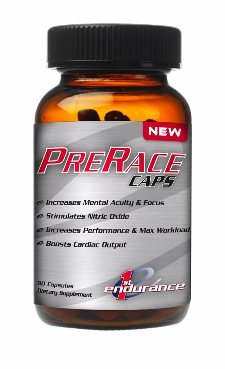 PreRace comes as a flavor free powder which can be added to any pre-exercise or during exercise drink, like EFS. PreRace Clinical Study on a 40k Time Trial. I bought to try this product to see how it will affect my mountain and road biking performance. I'm very pleased with it. So I generally take 2 capsules 30 minutes before ride time and 2 more about 2 hours in to my effort. The best feeling I can describe is like drinking two cups of coffee without warming up (important when it will be a hot one) and not feeling like I have to use the restroom due to all the extra fluid. Performance benefit - maybe awake and ready to hit the road - absolutely. Tried not taking it and notice my legs were not "awake" until after 10+ miles - so I feel it does help. There is no real "buzz" type of feeling, which I can do without. There is also no "crash once the capsules have worn off; another sign of a good product. The capsules avoid the awful taste of the powder that I used to have to mix with my drinks. You will climb every hill in your big ring, win every sprint someone challenges you to, and execute your cornering with absolute focus and precision.